The Rubbermaid FG334900GRAY utility box has a 4.625-gallon capacity and is made of heavy-duty gray polyethylene. It has a reinforced bottom, handles, and ribs to add strength and support when lifting. 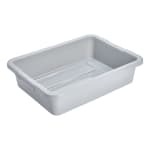 To facilitate cleaning, the bus box has rounded corners and is dishwasher safe.